Please note. TRED Pro device comes in a pair (one set). TRED Pro’s unique and patented composite construction, ensures that in the unlikely event that your wheels spin during a recovery, the ramp/teeth will not suffer instant catastrophic damage as has been experienced with other leading recovery ramp products. Due to the special polyolefin material blend TRED Pro's can handle high levels of flex, are highly durable and wear resistant. The mix of elasticity and tough rigid design in the main body means that your TRED Pro’s maintain a high level of pressure on your tyre to provide ultimate traction whilst still being able to take the flex of being under vehicle weight on unstable ground. The new TRED Pro features a unique patented grip profile, specifically engineered to engage with the one common denominator in most tires, the water evacuation channels on the outer edges, known in the tire industry as sipes, we call it SIPE-LOCK™. By using advanced technologies such as 3D scanning and CAD modelling we inspected hundreds of the biggest brand tires around the world to optimise the TRED Pro design. 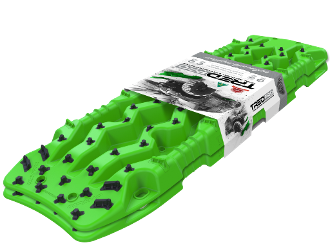 This feature makes TRED Pro the ultimate in traction for recovery devices. By creating a database of the worlds biggest selling off road tires we were able to use real data, dimensions and tread patterns to optimize our design more so than any other recovery device of this type in history. Integrated design features enhanced ergonomics and provides maximum grip, comfort and control to clear debris & obstructions for optimum TRED placement prior to recovery. The new contour ramp has been engineered specifically to hug the tyre for optimum tire traction and vehicle recovery in all conditions. Stealth Mode Engaged - Dual Colour Tone - TRED Pro comes in our unique New Gun Metal Grey body combined with Stealth Black teeth. TRED Pro is super functional and also looks great.